A few times a year, I fall in love with tarts all over again, and not only because Alex thinks that “fluted removable bottom tart pan” is the best name given to any kitchen tool, ever, but because there are few things not made tastier when rendered wide and shallow, in a flower-like shell. In the winter, I gush over slices of warm quiche, on a plate billowing with lightly-dressed greens, or a deep, rich, hard-to-forget ganache tartlet but in the summer, its fresh fruit or bust. This past weekend not one but two tarts exited my kitchen in a new Envirosax tote bag, both entirely inspired by the city of Paris. The first headed for my friend Molly’s dinner party on Friday night, a take on the classic tarte au citron (lemon tart) so fabulous, I might never make stove-top curd citrus curd again. I’ve mentioned before an ongoing fascination with “whole citrus” recipes, those that know that the whole shebang–from peel to pith to pulp–smartly leveraged in a dish is infinitely more satisfying that those that just go for the more low-hanging ingredient of juice. 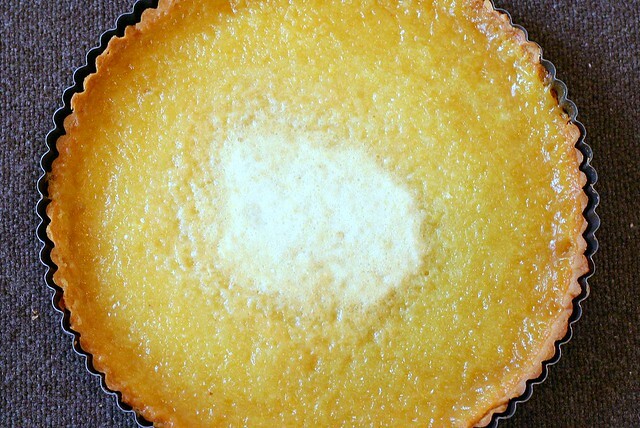 This entire tart is made with one single lemon, ground to a pulp with sugar, then mixed with egg, melted butter and cornstarch and seared in a par-baked crust until the top is bubbly and the taste is absolutely worth bragging about. The simplicity of ingredients alone makes it worthwhile, but the grown-up flavor with the bitter, fragrant vibe straight from the lemon’s edge makes it ready for its close-up. I can’t wait to make it next with two key limes, half a ruby red grapefruit or a whole orange. Because it’s hard to miss those jagged edges, I must mention that I have been struggling with my pate sablees (sweet cookie crusts with sugar and eggs) lately, and while I suspect there are many things to blame–namely that I don’t seem to have enough pie weights to hold the sides up in the par-bake, and was out of dried beans that could be used instead–seeing as I followed all the other rules of the tart dough–keep it cold! Don’t stretch the dough!–I have decided, somewhat illogically, to instead blame the recipe I’ve been using, which includes ground almonds. I think next time I’ll go back to a pâte sucrée (flaky pie crust with just sugar) and see if it fixes things. Eventually, however, I think I’ll have to question my skills, but I hope to put that off as long as possible. I’m sure you understand. 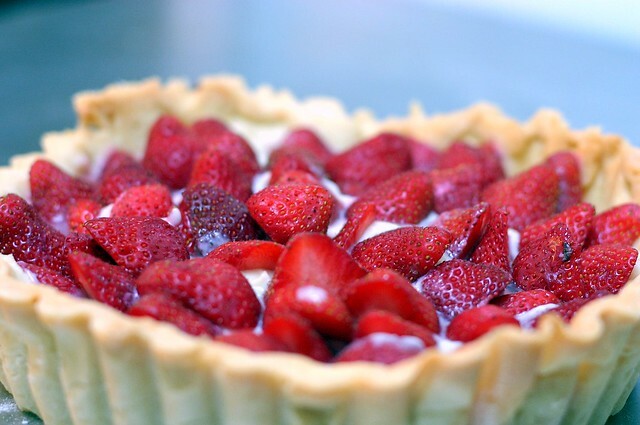 Shortly before you are ready to serve the tart, spread the pastry cream in the bottom of the baked tart shell and arrange the strawberries over the top. Le voila! 1. Bring the milk and vanilla bean (pulp and pod) to a boil in a small saucepan over medium heat. Cover the pan, turn off the heat, and set aside for 10 minutes. Or, if you are using vanilla extract, just bring the mil to a boil and proceed with the recipe, adding the extract before you add the butter to the hot pastry cream. 2. Working in a heavy-bottomed medium saucepan, whisk the yolks, sugar, and cornstarch together until thick and pale. Whisking all the while, very slowly drizzle a quarter of the hot milk onto the yolks. Then, still whisking, pour the rest of the liquid in a steady stream over the tempered yolks. Remove and discard the vanilla pod. 3. Put the pan over medium heat and, whisking vigorously and without stop, bring the mixture to the boil. Keep the mixture at the boil, whisking energetically, for 1 to 2 minutes, then remove the pan from the heat and scrape the pastry cream into a clean bowl. Allow the pastry cream to cool on the counter for about 3 minutes. 4. Cut the butter into chunks and stir the chunks into the hot pastry cream, continuing to stir until the butter is melted and incorporated. At this point, the cream needs to be thoroughly chilled. You can either set the bowl into a larger bowl filled with ice cubes and cold water and, to ensure even cooling, stir the cream from time to time, or refrigerate the cream, in which case you should press a piece of plastic wrap against the surface to create an airtight seal. a yummy tart with just one lemon. i can’t imagine but i will soon try. i’ve voted and my super powers tell me you are going to win. good luck! Oooo, the whole lemon tart sounds delicious and I love the grapefruit idea! Tarts are always welcome around here. The whole lemon tart looks and sounds absolutely delightful. I will sure make it! I got really excited thinking “Oooo a lemon tart with strawberries!”, but I guess not. It’s looks great though, I’ll definitely make it. I use Martha Stewart’s version of a Pate Sucree and it’s always worked out. I hate it when pie/tart doughs don’t. Fabulous tart! And I don’t know how you hid from my camera on Friday night–butcha did! Guess I will see you this Saturday? Hope so! Snicker, snicker. I didn’t hide. I just borrowed your camera long enough to take all the unflattering pictures of me off. Sadly, after that there were none left! I need to make both of those first chance I get – the idea of a whole lemon made so simply into a tart is making me drool – it sounds like the best, most gorgeous lemon curd imaginable. And fruit and pastry cream? Summertime perfect. I need to hit the farmer’s market. Everyone send Debbie and Alex out here to see me! I am going through withdrawal. In return, I will a) register to take the class with them even though I am a certified grill mastress by birth and b) pony up many bottles of wine for their visit. I am such a stellar friend. I like to torch my lemon tarts and sometimes cheesecakes. I am so excited by the idea of that lemon tart, I do admit it’s a bit unseemly. Yay for whole citrus recipes! I’ll say it again, deb, I’d love to see you two go to Napa (even though I’m nominated, I know I won’t win); I’m excited to see you’re at the top of the heap. Here’s hoping you stay there. I LOVE tarte au citron, and Mercedes is right, the grapefruit version is divine. I always have lemons on hand so I’ll give this lemon tart a whirl this evening to see if it’s a good finale to my planned cold greens soup and roasted veggie medley. I’m also seeking to alter my cooking habits to avoid overloading the A/C unit. I’m psyced to see you’re #1 on the Grill Me polls!! You got my vote! Tams — Super powers! I want some too! Mostly, I just do the elbow-elbow-bow thing and try to will myself home from work midday. Hasn’t worked… yet. Jelena — I have used MS’s Pate Sucree as well and need to get back to it. So many of the tarts I’ve made in the last year are from Paris Sweets, and they all suggest this same Sweet Tart Dough, which although delicious, is quite sticky and, at least in my case, just not working as well as I’d like. However, I did make cookies with the third dough last night (deciding I wouldn’t use it for a tart after it made two ugly ones) and yum–they’re perfect. Ah, one more thing: because the sweet tart dough I’ve been using has ground almonds in it, a friend who is allergic to nuts couldn’t eat the tart on Friday. That bummed me out, and one more reason to use a more basic one. radish — Oh, but I did. Yay! However, I have days and days of recipes to catch up on after being on a huge, ick deadline last week so most of the upcoming pics will be old and, in comparison, fugly. Ang — Yay! Wine, Ang and WP! We actually thought for about 2.5 seconds that if we made it out there, maybe we should go to the French Laundry? And, well, um, no. I can think of ten things I’d rather do with my next $700 and most of them rhyme with Shmaris or Shmeurope. Vanessa — That’s a great idea! As you can see, this sort of cooked unevenly. I wasn’t sure if I was supposed to have cooked it until the center was bubbling, too, but I was a few minutes over the cooking time so I took it out. Next time, I think bruleeing would nicely finish the job. I wanted to share my family’s way of avoiding soggy bottoms on pastry cream-filled tarts, inspired by a local bakery: spread a very thin layer of melted dark chocolate over the surface of the cooled crust and let it harden before adding pastry cream, or do a simple egg wash for the last few minutes of the par-bake. These provide a minimal sort of “seal” on the crust that won’t allow it to get as soggy as it otherwise might. This is especially helpful if your leftover fruit tart tends to become the next morning’s breakfast, as it often does around here. Who needs the French Laundry when you can get chicken IN A BUCKET at our favorite restaurant in our ‘hood? They even call it a smitten kitchen in this article. The best thing about being out here, in my mind, is the fried chicken trend. We will take you out for some. Alex will hug me. Today I got an email telling me I won a copy of Mastering the Grill! All because you told me to vote for you. Thank you! Yay! I come back from Vegas and I see beautiful strawberries on your site. And, not just strawberries in a crate but they are in a tart. Then you wax poetic over lemon cured, who wouldn’t be in love? Now, I’m off to dream of gorgeous tarts from a removable bottom pan. That strawberry tart is calling my name! I have some berries and cream to use up before vacation… I may have to give this beautiful tart a try! This is my first visit to your site – and although I have no wisdom/creative juice to contribute along the lines of tarts, I am captivated. Awesome photography. Incredible content to delve into a learn a thing or two about kitchens, food, restaurants, eating…you name it. Kudos to you. Thanks for the site. I’ll be back…often! Oooh, I tried my hand at the lemon tart last night. It was super easy – easier for me because it was late and I cut corners with a ready made crust dusted up with some extra sugar. Sssshhhh. So easy and so yummy! I see this one will be a summertime favorite of mine. I LOVE key lime. I made wee key lime tartlets last summer, but this version would be even better. Next party! Not only do they have the best name, but those tart pans are so darn pretty! I love having them around in the kitchen. These tarts are gorgeous. I’m making a lemon tart tomorrow for a dinner I’m having … and am already starting to feel very pessimistic about my pastry, even though the recipe is good. I just always end up with ugly edges… the pastry seems to shrink back from the side, and unevenly. What am I doing wrong!??? i’m not sure gorgeous even does this justice. WOWOW! The first time a smittenkitchen recipe has disappointed :( The lemon curd was way, way too sweet and it didn’t set properly unless i refrigerated it! This is the best lemon tart I have ever had. I have been bragging all week to everyone I know that I made the best lemon form scratch – using a whole lemon! I cannot imagine eating a boxed version now. So I started out making the strawberry tart for a dinner party (three hours later). I just picked up some kumquats at the farmers market (so cal) and decided that I would chop them up and toss them in with the strawberries. As I was making the crust, my partner’s brother started talking to me and kept distracting me, so when I went to bake the crust, it was pretty much a disaster! Don’t let anyone distract you when you’re trying to make pastry!!!! In the meantime I made the pastry filling which turned out great; I added chopped kumquats to it and chilled it.I prepared all the strawberries and with 45 minutes left I went to make another crust. He did it again!!!! Wouldn’t leave me alone!!! Disaster number two and 20 minutes to go. SO, I whipped a cup of heavy whipping cream then folded it into the pastry filling – it made a beautiful mousse. I served it up in bowls with strawberries and more chopped kumquats. It was awesome! Would the cornstarch really be necessary if I used full on heavy cream in the pastry cream? Starch icks me out a bit. I’m trying to figure out the perfect birthday cake for my best friend who doesn’t like “rich” desserts, and I’ve narrowed it down to the crepe cake and this. Any other suggestions? I admit the “ick” factor is not logical. I’ve happily used starch in other recipes the thicken fruit liquids; just yesterday, in fact, in the blueberry crumb bars. I just think starch makes custard taste chalky. And, I’m lactose-intolerant, so I’d rather use cream than milk. Thanks for the advice, though. I’ll do some searching. Hi, Great site! I just wondering if you have solved the problem of pastry shrinkage. I have tried many shortcrust recipes and still struggle to get an even tart, so I would be very interested to know if you have discovered any solutions! Thanks. Yes, you should check out my Great Unshrinkable Sweet Tart Shell — it’s pretty reliably shrink (or virtually) shrink free. It’s my pictures where the color is off (blueish light). Because there are egg yolks in pastry cream, it should have a yellowish tint. And if yours is extra-yellow, you’re probably just getting extra fresh, good eggs. (Extract will also increase the tint.) If it tastes good, run with it! Hi there – I’ve been reading your site for a few months and tried a couple of your recipes for a New Years Day brunch — the Whole Lemon Tart here and your Winter Fruit Salad. Both were fantastic, and I almost didn’t even get to try the lemon tart because it disappeared so fast! One question about the lemon tart – I don’t have a proper food processor or blender, so I wonder if the lemon curd is supposed to be perfectly smooth (the way it would be if you made it only with lemon juice). Mine (made with a slightly fancy hand blender-ish thing) had a little more texture to it than other lemon curds I’ve made — not in a negative way, but you could definitely tell there was peel in it — I’m just curious if yours turned out that way too. The fruit salad was great on its own and also made a nice accompaniment to David Liebovitz’s Fresh Ginger Cake (from Epicurious, Nov ’99 – if you haven’t tried it, I highly recommend it, although I use less oil than the recipe calls for). Anyways, thanks for the recipes – I love your writing & photographs and always look forward to new posts. I’m planning to make the strawberry tarte tomorrow, but a little perplexed by the moist, plump vanilla bean. The ones in my cupboard are dry and wrinkly. Do I need to rehydrate them? Or do they get moist and plumped in the hot milk? It should get plump in the hot milk. Don’t worry if yours looks dry, however, the seeds inside should still be soft and able to be scraped out. Made the Strawberry Tart today— YUM! The Sweet Tart Dough recipe worked well for me, and I am definitely no pastry expert. I refrigerated it for ~45min and it rolled out nicely without sticking, though it did crack on the edges. It did shrink a bit once baked, but uniformly around and still produced a lovely edge. I think my edges were thicker which may have helped? First time with pastry cream…wow, it is delish. How could you ever buy a store-made tart again? Thanks for the wonderful recipes and Happy Easter! Just made the pastry cream and it is delicious. How thick is the layer of pastry cream supposed to be? I made the amount called for, but it doesn’t appear to be nearly enough for the strawberry tart. I’m thinking I was either too heavy-handed with the cornstarch, or else my cream thickened too much because I only had extra-large, rather than large, egg yolks. Any assistance would be appreciated! Also, this is my first time posting, but I have been obsessed with your site ever since I found it looking for a madeleine recipe. Can’t wait for the cookbook! Hi Trisha — It’s generally a thin layer. Just enough to wedge the berries into. Deb, thanks so much. I was good on the pastry cream front, and my mother loved the tart. (Was for her day after all!) Thanks again for your very timely response! Deb, I’ve acquired a number of meyer lemons and am trying to maximize their use, but don’t have any events requiring deserts coming up (plus I keep getting distracted by rhubarb). Would you recommend I make the filling for the whole lemon tart, and then freeze it for future use? Or freeze the lemon-sugar-egg mixture and add the starch and butter when thawed? Patsy — How wonderful! You could do either. But you know, the only shelf life issues would be from butter and eggs so you might as well add them when you’re ready, and be able to store it the longest in the freezer. Enjoy! Is the missing word in #4 supposed to be butter? Jessica — Ha, yes. Now fixed. Thank you. I just attempted the pastry cream using fat-free milk and to my delight (and surprise) it worked fine! Hey Deb, would using half & half rather than whole milk be okay in the pastry cream? That’s all I’ve got in the house, I’m afraid, heh. Pastry creme: is the yolk and corn starch suppose to be under a medium heat, then add milk. Or no heat, the hot milk is enough… (from Step 2). Thanks! The best part of this is that in Step #3 of the Pastry Cream recipe, you called it “party cream”. I love you and this recipe for this reason – next time I make it, I am going to imagine little party hats and streamers being put up inside the pie shell. By the way, this was sublime. I may or may not have made the pastry cream and sat in complete gluttony with a bowl, some strawberries and a series of movies involving George Clooney running around doing some things. Hint: I did. And it was fabulous. Maxe — Best typo, totally! But I am compelled to change it now that I know about it. :( Party pooper! I did the same thing as the guy above and made the two together. At least, I tried. I’ve never been very good at custard-y things so my custard didn’t turn out, but I just replaced it with fresh whipped cream and it was magically delicious! Hmmm… My cream turned out waaaaay too thick! How long was I suppose to whisk it over heat for? To Patsy @ Post 37 – The pastry cream works remarkably well with soy cream, if you’re lactose intolerant, but still use the corn starch. Or a tablespoon (and a half)of arrowroot powder if you prefer. I was surprised. I’m allergic to milk products, but I tend to frown upon using “dairy substitutes” like soy. I just come up with recipes that don’t need milk or cream – like egg whites, chocolate, fruit zest, etc. But soy cream is now my go-to-milk substitute. Don’t use soy milk. It usually tastes a bit… odd. To Deb – Thank you, Thank you! My crust came out really well. Strawberries are just about in season and are seducing me at every corner. The only was that I made two tarts. One with butter and milk, and a set of tarlets without butter or milk. Took forever, but very much worth it! Tried out the strawberry tart and loved it! Deb, I’m in the midst of making the strawberry tart (just went strawberry picking and can’t wait to use them! ), but I’m afraid I didn’t let the pastry cream boil long enough, and as a result it’s not thick enough. Can I boil it a second time to thicken it up, or is that a bad idea? I’m salivating, because the cream tastes SO good, but I can’t finish it up! Thanks! Let it fully cool and see if it thickens. Use the fridge. Just came into the archive to have a look at the strawberry tart;and have made and loved the lemon. I saw your comment about never having enough pie weights. Oh yes you do, and so do we all !! Look to that jar of pennies that you must have somewhere..They are perfect..CHEAP, conduct heat in just the right way, and are reusable.. first wash them in hot soapy water. (and then you use them on foil or parchment anyway) I keep a big tin of them in the kitchen ..started using them in the country many years ago when other weights were not to be had,(never liked using beans..I could always smell them.) and now prefer them to the overpriced..never enough of them weights that I have in the city. Pennies from heaven..
Marcia, I love your idea for Penny, Pie weights. Most everyone has that jar of pennies stashed somewhere “Not being used”, they worked wonderfully. But I used a piece of heavy duty foil so there would be no breakage when I lifted them out of the half baked crust for my strawberry tart. Thanks for this recipe. I made it for my family for Ramadan (Islamic Holiday). I just had some questions about the Pastry filling. I’m a novice so please bear with me. The Recipe called for the milk to boil, I turned up the heat, but the bottom started to burn before the milk came to a boil. I’m sure I’m doing something wrong. I’m using Vanilla Extract. What should I be doing differently? When I mixed in the milk with the egg/starch/sugar, it immediately turned into a large yellow glop, despite my heaving stirring. I let it cool for 3 minutes and then added the butter and stuck it in the fridge with saran wrap. 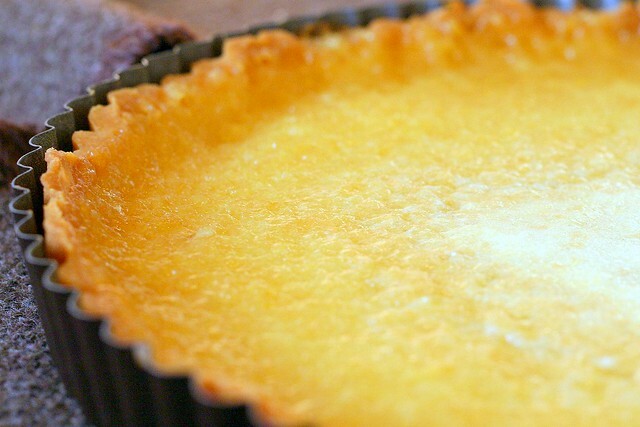 I used store bought tarts as an example and their pastry filling was very creamy. Is there anything I need to be cognizant of the next time I try this recipe? Also, I wasn’t satisfied with the amount of Filling there was, how can I make a larger quantity without having to make a whole new batch? Does doubling the ingredients work? Again, I apologize for my novice baking questions, any help would be amazing. Cheers! Kaitlin — Ha, thanks! I think it was a holdover from when this post included a lemon tart. Fixed now. I just wanted to put up a little note to say that this is the first time I have made a pastry cream that has actually turned out… and I have made many terrible pastry creams. I almost cried. Thank you so much!!! I made this for father’s day and turned out just as delicious as it looks! I have a question though – why do we need to cook the crust with dried beans or rice? And can I use the dough to make mini-tarts? If yes, do I need to go about it the same way (filling each mini-tart with dried rice/beans? The beans/rice hold the shape while it bakes, so the walls don’t slump. Mini tarts — yes. Same method. I often find that the dough for 1 9-inch tart makes 6 (yes, SIX) 4-inch tartlets. Thanks for answering my question too Deb, that means a lot to me. I made this for our 4th of July BBQ and I’m so glad I did!! I made the crust the morning of, and the pastry cream the night before. I was a little worried because it seemed like all of a sudden the pastry cream thickened up. I took it right off the stove and after cooling, threw it in the fridge. It was delicious! Perfect pairing with strawberries and the crust was fabulous!! Thanks again Deb!! You’re my go-to for awesome recipes. This is a go-to dessert for me. I use the Unshrinkable tart shell. I’ve found that the tart looks and tastes just as good on the second day and can definitely be assembled ahead of time. On the third day, the color of the strawberries (or whatever other fruits you use) starts to bleed some into the custard, but flavor is still amazing. Surprisingly, the tart shell has never become soggy, even after 3-4 days. This is a definite winner! Thanks, Deb! Thank you for this recipe Deb. I brought the strawberry tart to a friends’ dinner last night. Everybody loved it and it really did not take a lot of effort from me to make it. I am expecting my first child in july and I cannot wait for him to be old enough to eat cakes and tarts. Greetings from Qatar. can freeze this until the night before. I made the pink lady cake in 2 9×13 pans after increasing the recipe by 1/3 (even with my questionable math skills) and want to torte and fill with pastry cream. Think that would work or be too unstable? I would make a buttecream dam…. I have just not ever made pastry cream before! hi. i would like to make this tart non dairy. what is best to substitute for the milk? should i use soy milk or is rich whip better? thanks:) it looks great cant wait to try it! I haven’t tried making pastry cream with anything but milk, but it looks like Zoe (Comment #64) had mixed results with soy milk/cream. I wanted to use this recipe as a fingerfood for a party; made the unshrinkable tart shell, cut it into small-ish cookie rounds, baked them until golden, added a spoonful of custard and a strawberry half to each- worked great and got rave reviews! I am going to try to make this. It’s been some years since you posted so I am wondering what the verdict is. Almonds vs no almonds in the crust. Let me know when you get a chance. Scaled up the pastry cream by 1.5 to fit an 11 inch tart pan (using the SK recipe for the great unshrinkable sweet tart shell, which I also scaled up by 1.5). Both the tart shell and the pastry cream came out beautifully! I think next time I might decrease the cornstarch a bit if I scale up, as it thickened A LOT as soon as it came to a boil and ended up with an almost pudding-y texture. I also used a whole vanilla bean when I scaled up and the vanilla flavor was super strong; next time I might add cognac or something similar, as Ina Garten recommends to the give the flavor a bit more depth. Regardless, rave reviews for the tart, with I topped with nectarines and raspberries. As always, Deb steered me right!